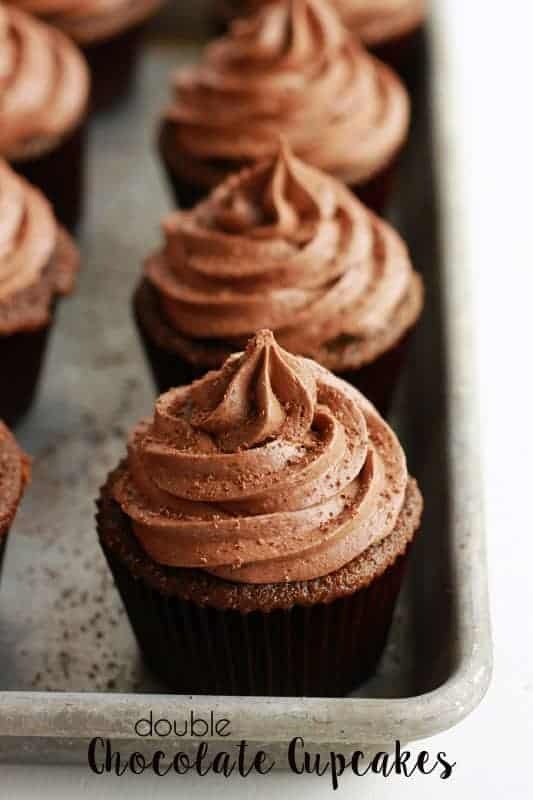 Double Chocolate Cupcakes. 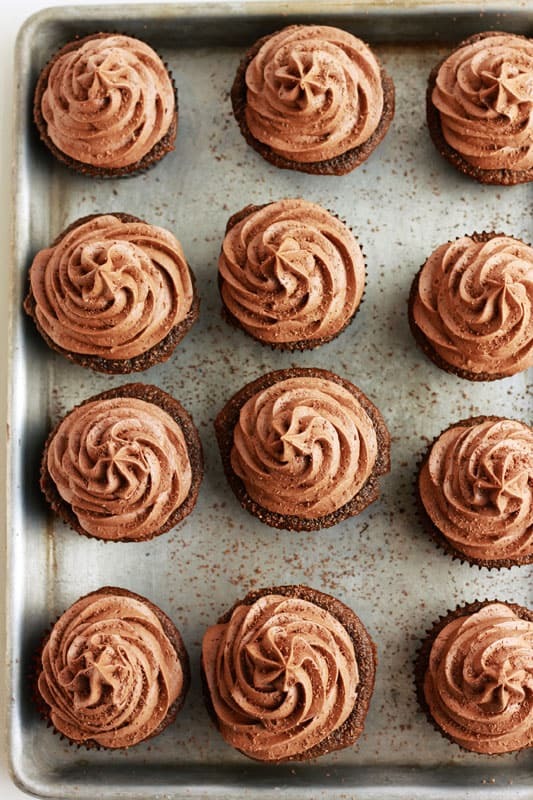 These homemade chocolate cupcakes are the perfect cure for a sweet tooth! 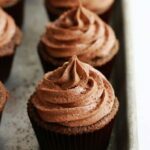 Fudge-like cake is topped with a smooth and creamy chocolate buttercream for the perfect dessert recipe! For real people… I loooooove me some desserts. January has to be the hardest month of the year for me. I try to keep up with the trends and stick to a more healthy display of recipes here on the site. A lot of my sweets patiently wait for February to roll around so they can make an appearance for Valentines day. I decided to try to sneak just one more treat in before everyone dives head first into their New Years resolutions. When deciding what recipe to make I turned to my good old friend, Chocolate. You might know him. He’s that delicious treat that always shows up when you need him. Always seeming to comforting you through emotional and happy times. Never judging when you eat one or two (or an entire case) of salted chocolate caramels. Not that I’ve ever done that…. THIS recipe has not one but TWO doses of the good stuff. It all starts with the super moist and rich cake and is topped with a smooth fudge frosting. Feel free to start drooling right now. 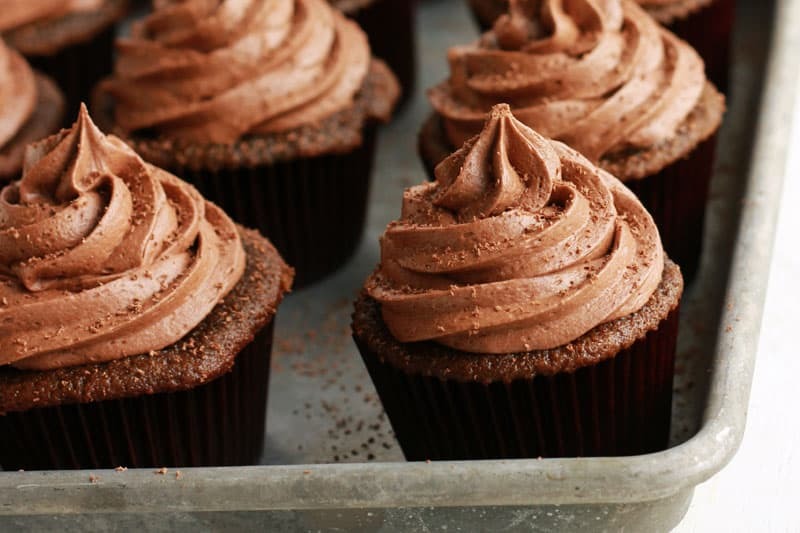 In case you want a quick how-to on the frosting design… I used a 1M tip. Just start from the edge and work your way to the middle. 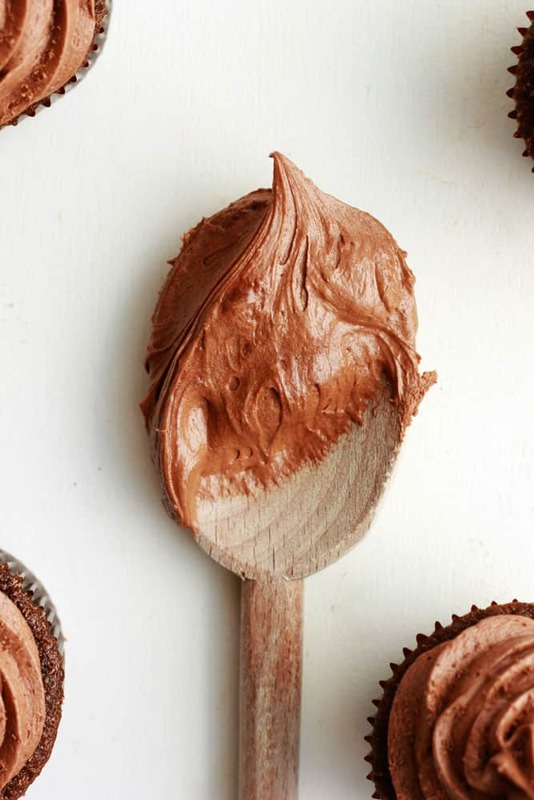 Beautiful frosted cupcakes are just a quick swirl of the wrist away. Like this recipe? You will love my BEST EVER Brownies, Best Ever Chocolate Cake, and Chocolate Cake Donuts! Preheat your oven to 350 degrees. Line two muffin tins with paper wrappers. 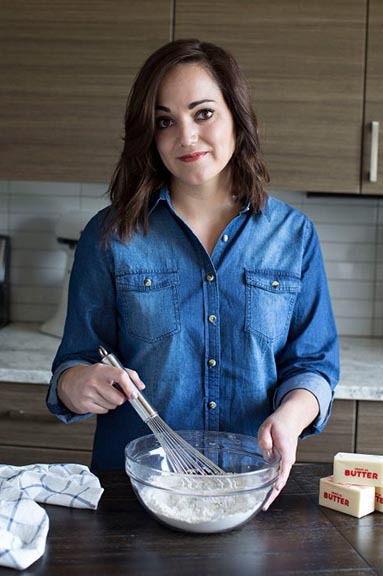 Whisk together the flour, baking soda, and salt in a small bowl. In the bowl of an electric mixer cream the butter and brown sugar. Add the eggs, one at a time, followed by the vanilla and melted chocolate. Stir in the dry ingredients and sour cream. Fold in the coffee. Fill each cupcake liner 3/4 full. Bake 12-15 minutes or until a toothpick comes out clean. Whisk together the butter, shortening, cocoa, and powdered sugar. Stir in the cream, fudge topping, and vanilla extract. Whip until fluffy and spreading consistency. It actually makes my mouth water just wanting to lick that spoon. These look delicious. I have always been a fan of cupcakes as my mother is an avid baker. so glad they are now so popular…although thats another inch on the hips. Looks very delicious but can you please share the hot fudge recipe. Thanks.